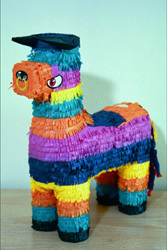 Pinata – do you even know what that is? Am sure all of you have come across at least one in your life time. Please note that some of the below information has been taken from Wikipedia (http://en.wikipedia.org/wiki/Main_Page). In Mexico among the Aztecs, Mayans, and other native peoples, clay pots were created in the shape of their gods. These pots were meant to be broken forcefully with poles and sticks, so the contents spilled to signify abundance or favors from the gods. Historians believe that during the birthday celebration of the Aztec god of war, Huitzilopochtli, priests hung a clay pot on a pole in the temple. The pot was adorned with colorful feathers and filled with small treasures like bead ornaments, colorful or painted stones, berries, or nuts. When the pot was broken with a stick the little treasures spilled on the feet of the god as an offering. The Mayans played a game where the central player’s eyes were covered with a cloth while he tried to hit the pot that was suspended by a string. It’s great to see how far the traditional Pinata has come and with a little imagination and creativity anything can be made into a Pinata following the theme of your party!